Larung Gar (Tib. བླ་རུང་སྒར་, Wyl. bla rung sgar), or the Centre for the Five Traditional Sciences and Higher Buddhist Studies (lnga rig nang bstan slob gling), situated in the Sichuan province of China, was established by Khenpo Jikmé Phuntsok in 1980, and is today one of the most popular centers of Buddhist learning in the world. Also called Lama Rong, the site was originally founded in 1880 as a mountain hermitage by Dudjom Lingpa when he was 45 years old. The site, where the Dudjom Tersar was propagated by Dudjom Lingpa, is said to have been the residence of thirteen great masters who attained rainbow body. Among the many masters who resided later in Lama Rong is Yukhok Chatralwa Chöying Rangdrol (1872-1952), a disciple of Tertön Sogyal. Larung was established by Khenpo Jikmé Phuntsok in 1980, on the tenth day of the sixth Tibetan month. This was in accordance with a prophecy of the First Dodrupchen Rinpoche, who had prophesied that "in the land of Lama Rung [...] there will appear one named Jikmé" who will "illuminate the teachings of sutra and tantra" and whose followers will pervade throughout the ten directions. 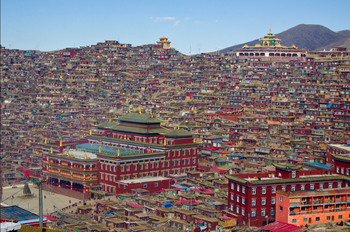 Larung Gar ranks highly among the numerous achievement of Khenpo Jikmé Phuntsok, who took over the site in the summer of 1980 and maintained it as a Tibetan Buddhist encampment (Wyl. chos sghar), a mobile community traditionally inhabited by practitioners around a charismatic teacher. Khenpo Jikmé Phuntsok opened a small shedra and a retreat center (drupdra) and began to offer teachings and commentaries on a variety of scriptures from the sutras and tantras. Khenpo Jikmé Phuntsok’s charisma and erudition gradually attracted large number of practitioners to Larung Gar, and the curriculum soon expanded to include grammar, philology, epistemology, reasoning, monastic discipline, Madhyamaka philosophy, lojong, tantric textual commentaries, Dzogchen and pith instructions. The Seventh Panchen Lama’s endorsement and Khenpo Jikmé Phuntsok’s vision helped make Larung Gar one of the most popular centers of Buddhist learning in twentieth-century Tibet, and is example reinvigorated the Nyingma tradition, inspiring several Nyingma encampment to develop across Eastern Tibet. Larung Gar is a landmark of Khenpo Jikmé Phuntsok‘s commitment to disseminate Buddhism in an ecumenical fashion, to strengthen monasticism and Buddhist ethics, and to heighten religious education and Tibetan traditional culture. At its peak there were as many as 10,000 students in residence and on many occasions more than 100,000 students would gather to hear Khenpo Jikmé Phuntsok's teachings, making it the largest Buddhist teaching centre in the world. ↑ According to the biography of Khenpo Jikmé Phuntsok on 'Treasury of Lives'.